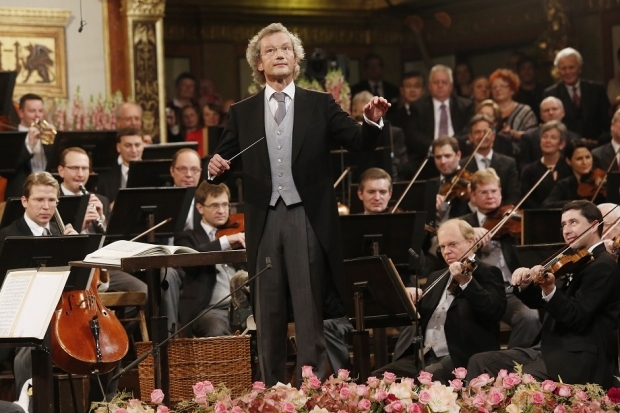 Franz Welser-Moest conducts the Vienna Philharmonic Orchestra’s traditional New Year’s Concert on January 1, 2013 in Vienna. The orchestra’s annual performance inspired a taste for New Year’s concerts around China. In late November of 2013, I sat chatting in a California concert hall with one of the PRC’s most famous first-generation pianists. Normally at this time of year, the pianist told me, he would be heading off to China to perform multiple New Year’s concerts with orchestras around the country. He was referring, of course, to the broad anti-corruption campaign launched by President Xi Jinping upon coming to office in November 2012. Corruption, Xi warned, could “kill the Party and ruin the country” if allowed to continue unchecked. Xi followed up in early 2013 with a now-famous promise to “fight tigers and flies at the same time” by combating bureaucratism, formalism, and extravagance in officials high and low. The impact of Xi’s words was remarkably swift. Fancy restaurants were suddenly half-empty, sales of many luxury goods began to slow, and by summer in the gated villa complex in Northeast Beijing where I have a home, our neighbor’s two Bentleys (one black, the other sparkly purple), Aston-Martin, and Ferrari had disappeared, replaced by a flock of work-a-day BMWs and Audis. In early autumn, the Central Commission for Discipline Inspection issued a follow-up circular reminding Party officials to abstain from hosting luxurious banquets and giving presents—and thus did classical music begin to feel the impact. Tickets to New Year’s concerts are popular gifts among the bureaucratic and entrepreneurial elite of China; the more expensive the ticket, the better. And, while some New Year’s concerts are open to all (and these are still taking place) any others are sponsored by government bureaus, state-owned enterprises, and private corporations for their own employees and invited guests. In recent years, a symphony from Beijing or Shanghai might be hired to give as many as twenty New Year’s concerts around the country, in Urumqi one weekend and Fuzhou the next, all funded by a local government or corporation. The tradition of the New Year’s Concert in China dates to 1987, when CCTV first broadcast the hallowed Vienna Philharmonic New Year’s Concert. Held each January 1 in the exquisite Golden Hall of the city’s Musikverein, the concert features mostly Austrian music—much of it from the Strauss family—performed under the baton of different guest conductors (this year Daniel Barenboim). Tickets to the live performance are hoarded like gold—if you watch regularly, you will come to recognize audience members in their long-reserved seats—but the show has a global television audience in nearly eighty countries. While the music-making is top-notch, the broadcast teeters on kitsch, interspersed with images of doe-eyed ballerinas prancing up palatial staircases and costumed dancers waltzing in glimmering ballrooms. It was, in other words, perfect for 1980s China and quickly became a tradition for many people. This year, the CCTV broadcast of the Vienna Concert was a remarkable six-hour extravaganza that used satellite links to combine the actual Vienna Concert with a simultaneous concert starring Chinese musicians and dancers at Beijing’s opulent, Golden Hall-inspired Reignwood Theater. In the mid-1990s, Chinese orchestras started giving their own New Year’s concerts—one of the first was on December 31, 1997, when the China National Symphony Orchestra, the Beijing Symphony Orchestra, and the Orchestra of the Central Opera and Ballet Theater joined forces at the Great Hall of the People. Overseas orchestras and entrepreneurs spotted opportunity and began pouring into major cities during the holiday season. While a few were world-class ensembles, many were pick-up orchestras (dubbed “fakeharmonics”) with “Strauss” or “Vienna” in their name, thrown together by impresarios who were eager to make a quick buck. As a result, there were an astonishing thirty New Year’s concerts in Beijing one year in the early 2000s, although the number fell as audiences grew more discerning. While I was not in China this holiday concert season my husband, the conductor Jindong Cai, was. He conducted one New Year’s concert for a foreign company in Shenzhen, but mostly he heard complaints about the impact of the austerity campaign, including a decline in sales of tickets that would have been given as gifts and a steep drop in private gigs. Indeed, when he visited the conductor of a major Beijing orchestra right before Christmas, he found the maestro busily editing the tenth version of his self-criticism, an obligatory part of the anti-corruption campaign in many bureaucracies. For years now, China’s government has reduced direct support to orchestras in an effort to send them “to the market” (even as it has simultaneously invested billions constructing state-of-the-art concert halls and opera houses); as a result, private New Year’s concerts have come to serve as an indirect subsidy on which orchestras depend. Moreover, in addition to putting on public gala concerts with high-priced tickets and performing for hire at private soirees, Chinese orchestras perform hundreds of free concerts each year in factories, schools, and rural areas. With income from the all-important New Year’s concert season reduced, many orchestras will have to tighten their belts. And odds are, it isn’t the targets of the anti-corruption campaign who will be most affected. Ironically, even as a chill has fallen over the New Year’s concert circuit in China, the more recent tradition of the overseas Chinese New Year Concert is heating up. The Ministry of Culture now sponsors a program called “Happy Chinese New Year” which aims to promote Chinese New Year Concerts around the world (not all of them classical music). This year, there are close to 100 “Happy Chinese New Year” concerts globally that have some level of official support from the Ministry. Among these is the New York Philharmonic, which gave its first-ever Chinese New Year Gala on Saturday February 1 under the baton of the renowned Chinese conductor Yu Long with performances by the pianist Wang Yuja, cellist Wang Jian, and singer Song Zuying, among others. Many other orchestras, like the San Francisco Symphony, have already been giving Chinese New Year Concerts for years and many others are starting to do so as well, including the Los Angeles Philharmonic. Having so thoroughly and enthusiastically adopted the Viennese tradition of the New Year’s Concert, China has now sinicized it and sent it back out into the world rebranded with Chinese characteristics. Though the institution may have a rough year or two domestically, it’s safe to say that while the anti-corruption drive will pass, the New Year’s Concert is here to stay.